You are here: Home / Big wind industry / Remember Life Before Wind Turbines Were Speared Into the Heart of Your Community? Remember Life Before Wind Turbines Were Speared Into the Heart of Your Community? Remember all those glowing stories about wind power outfits being welcomed into rural communities with open arms? You know, tales about how farmers are dying to have turbines lined up all over their properties? How locals can’t wait to pick up some of the thousands of permanent, high paying jobs on offer? How developers are viewed with the kind of reverence reserved for Royalty? If such a place ever existed? – it was probably just a case of one too many Single Malts, causing the usual senses to take an unscheduled break. After years of being lied to, bullied, berated and treated like fools (at best) and “road-kill” (at worst), for most, the ‘gloss’ comprising wind industry PR efforts to ‘win hearts and minds’ has well and truly worn off. These days, the communities aren’t so gullible; they aren’t so welcoming; and they aren’t willing to take it lying down. Despite having the skills of the best spin doctors in the business at its disposal, it’s “outrage” that’s become the word synonymous with the wind industry, wherever it goes. 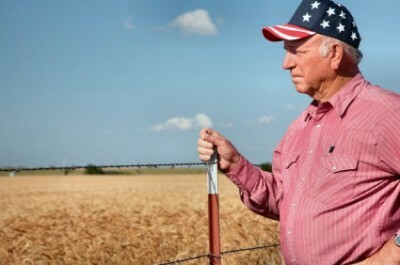 In short, rural communities have had enough – and they’re fighting back, by fair means and foul: Angry Wind Farm Victims Pull the Trigger: Turbines Shot-Up in Montana and Victoria. What wind spinners miss is the natural love that people have for their homes, their families and communities. 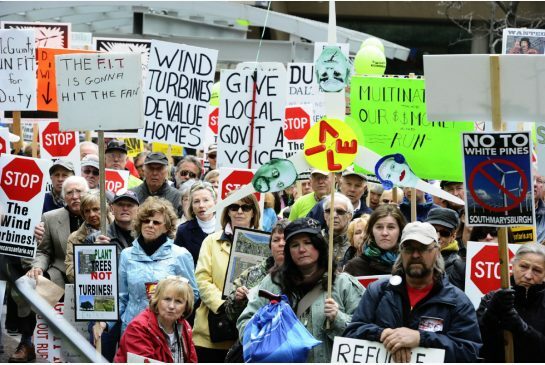 The destruction wreaked on what makes communities safe and prosperous is what drives people like Barb Ashbee from Mothers Against Wind Turbines to fight like fury. Here’s why. Remember the days when you used to go to the local outdoor market to buy fresh baked goods, flowers and honey, and …not to drag 120 “STOP THE WIND TURBINE” signs from the trunk of your car in hopes of educating the visitors. Remember the days when you went to a council meeting because your neighbour two farms down wanted to sever a lot and build their parents a home, but not to beg the council to uncover some hidden ancient by-law to protect the sanctity of your health and home from swarming developers. Remember when you could contact your health department with a concern and they would do everything in their power to help you, whatever it took, and they did not dismiss, insult and deny you with an issue serious enough that forced you to leave your home. Remember when you used to get together once a year with your neighbours at the local town hall to have potluck just to catch up, not to line up at microphones wondering how you were going to protect each other? Remember when children and the elderly were protected and cherished as those who may be considered at a disadvantage or needed extra loving care, not some extras in the household with “collateral damage” signs hanging from their necks. Remember when someone asked what your favourite thing is and you said just going home, having a drink on the deck and forgetting my cares for the day, instead of locking the windows and doors up tight to block out the invasion and running away when you have to. Remember when you used to go to family weddings and birthdays and could get lost in the excitement celebrating with everyone else, not sitting glumly in a corner with no recall of how to carry on a conversation that wasn’t slamming the government or railing against developers. Remember the friends that used to come and visit once in a while, for some good conversation and a bite to eat, who now don’t come near you because you have been taken into the netherworld and you can’t get out. Remember when you used to get in the car and drive for miles in anticipation of a great trip to a new unknown, and not driving for miles because you have to try to convince someone you’re having a big problem and you need them to listen. Remember when you could come home, respond to your emails in 10 minutes and carry on with your family, and not sit in front of your computer researching, preparing and communicating until 12 AM and rising at 6 to start all over again. Remember your Dad, pointing out the bird species and flora so you could recognize it when they graced your home, and not staring into the back yard and wondering where all the birds went and are they safe? Remember the sounds on a warm summer night? I started a petition “SA PREMIER JAY WEATHERILL : Demand the resignation of the Energy Minister for HIGH POWER PRICES CAUSING SA’s JOBS CRISIS and also 15,000 household POWER DISCONNECTIONS, frequent POWER BLACKOUTS and the JULY 2016 POWER CRISIS” and wanted to see if you could help by adding your name. I remember hot dark summer nights sitting on the front step seeing a cloud of bats swooping and flapping along the driveway; wedge-tails and their young being taught to fly in open and unhindered skies above our property and not praying for their safety; I remember the trust and faith I had in the ‘system’ to protect me and mine; talking about anything and to anyone; being in good health with lots of energy; life being normal and with focus and attention on our dream life. I remember when home meant peace and safety and sanctuary. I remember when opinion and expert opinion actually garnered due consideration and respectful treatment based on honest facts and evidence. I remember not knowing what wilful blindness is. I remember when science meant change and adaptation according to current evidence. I remember quietness and no grief and tears at ‘noise’. I remember noise not hurting. The problem is those who have instigated this change in life’s wonderful memories are those who never understood and could never understand because they have avarice as their ruler, they are empty of thought and sensitivity, they have no empathy and know nothing of the beauty of the environment they either live in or travel through, they have tunnel vision and that tunnel leads them into an empty, vapid life where they see nothing beyond the insipid soulless future they follow the road to. They are incapable of vision, of self thought and what is around them. The mire they constructed has been created to ensure they have a source of funding for their personal consumption with no desire to ensure the safety of the world. Why, because they won’t be around when the environment is so damaged nothing will be able to live in it. They have no desire to save anything for anyone because they are in effect zombies, they are dead to everything around them. I saw while on my way. Of red, at me and you. Those aliens have no souls. No more can humans take. The biggest “con” I have found. Unless the people make a stand. They’re for profit, (at a cost), that’s WHY. So true that it hurts like hell – and for what?